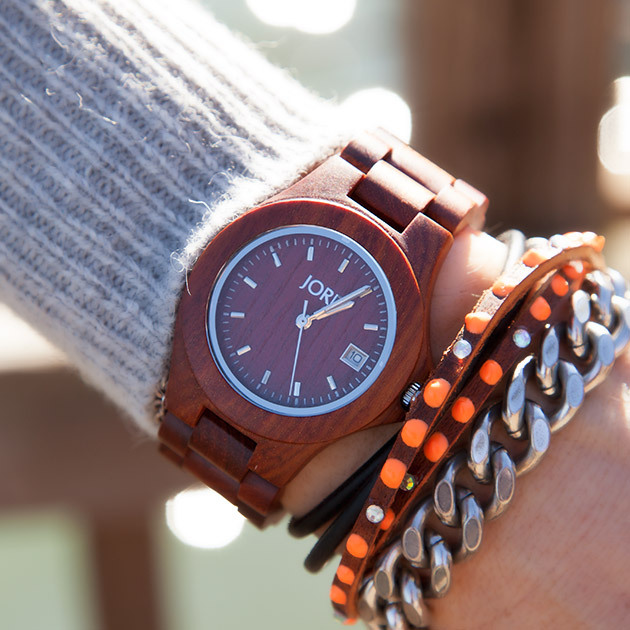 The Mod trend is everywhere for Spring. 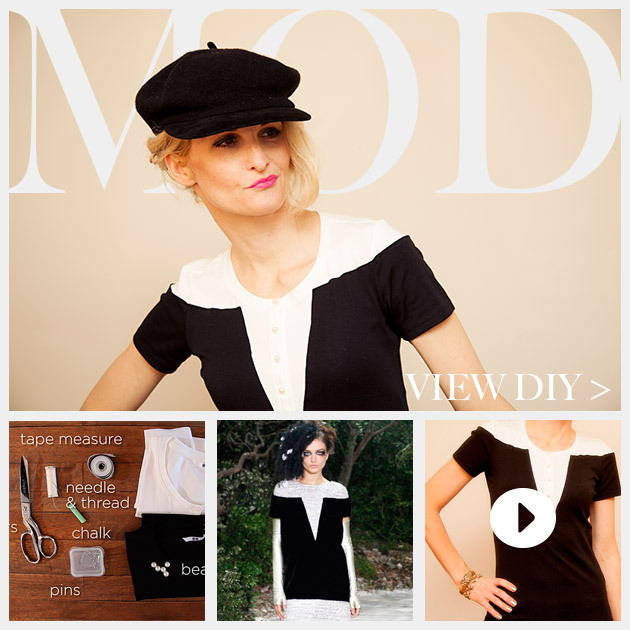 Add this cool graphic trend to your wardrobe with this Mod Black and White T Shirt DIY and check out the DIY video too! I’m so excited to announce my first DIY video!!! It has lots of detailed shots for this DIY so be sure to check it out and let me know what you think. 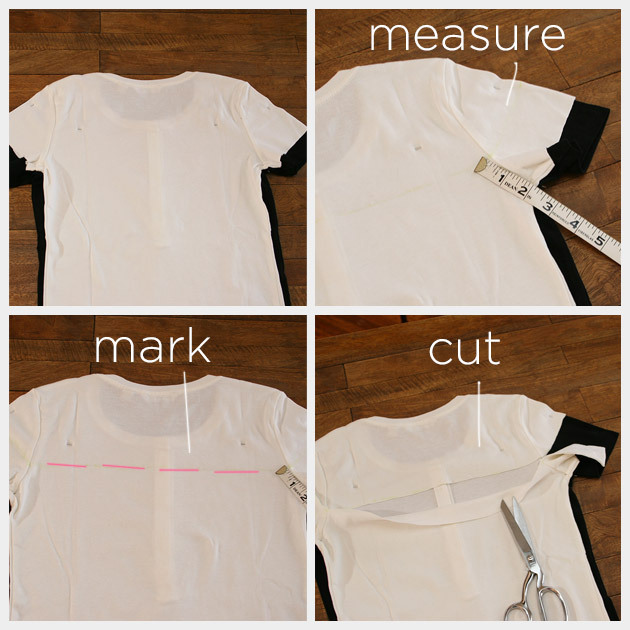 Layout your S/S black t shirt, using your tape measure and chalk, mark a line straight across the front just under the collar. When you get to the sleeves continue your line but angle it up following the line of the sleeves. Cut the top of your t shirt off along this line. 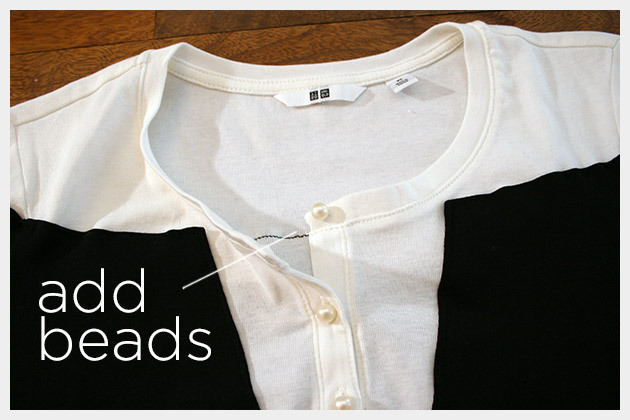 Layout your white long sleeve Henley and place your cut black t shirt on top. 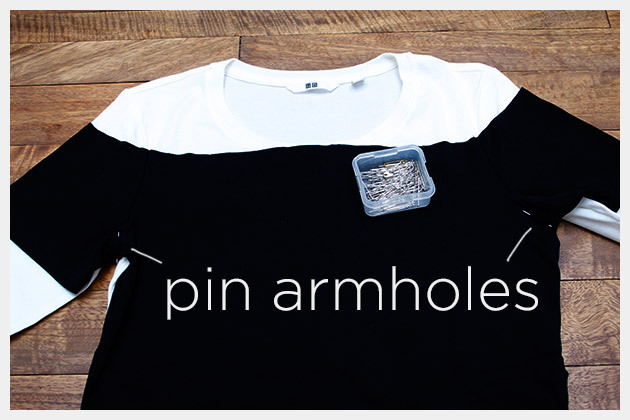 Pin your 2 shirts together at the bottom of the arm hole on both sides. 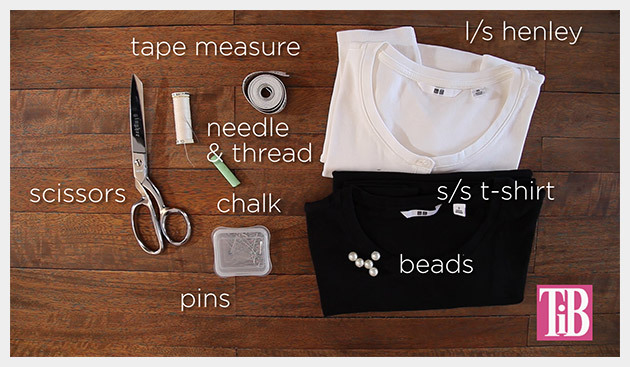 Pin your 2 shirts together across the top of the where you cut on your black shirt. Feel the bottom of the button placket on your Henley through the black t shirt, using your pins and chalk mark the bottom of the button placket just under the last button and mark the center top at the top edge of the cut black shirt. Using your tape measure draw a straight line between these two points. Turn your 2 shirts over (theyre still pinned together). 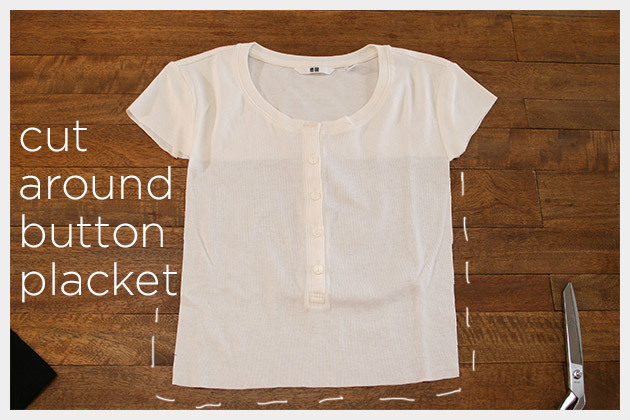 Measure about a half inch below the bottom of the arm hole on the white shirt and cut your sleeve off straight across. 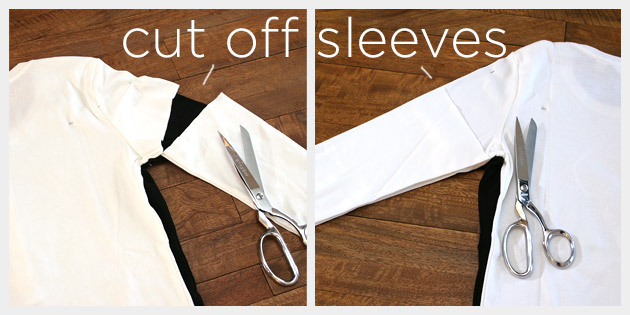 Lay your cut sleeve on top of the other sleeve and use that as a guide to cut the second sleeve. Set these sleeves aside for Fridays DIY. Now youll need to cut off the bottom of your white shirt. Using your tape measure and chalk, measure about 2 inches up from the bottom of the arm hole and make a mark. Do this on both sides and draw a straight line across the back of your white t shirt. Continue your line across your sleeves, remembering to angle them up. When you cut off the bottom of your white shirt youll need to cut off the sleeves and straight across your line only on the back. Cut the sleeves and just the back. Unpin your 2 shirts and turn your white shirt over to see the front. Youre going to cut down the sides of your white shirt about an inch in from the side seams and across the front about 2 inches below the bottom of the button placket. 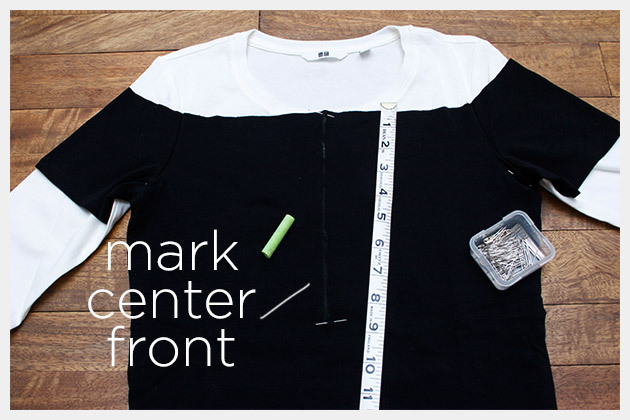 Lay your black t shirt out flat, double check that your center line that you drew is straight and centered. Cut straight down this center line. Now that your shirts are cut you need to pin them together. Start by putting your white shirt inside your black shirt. 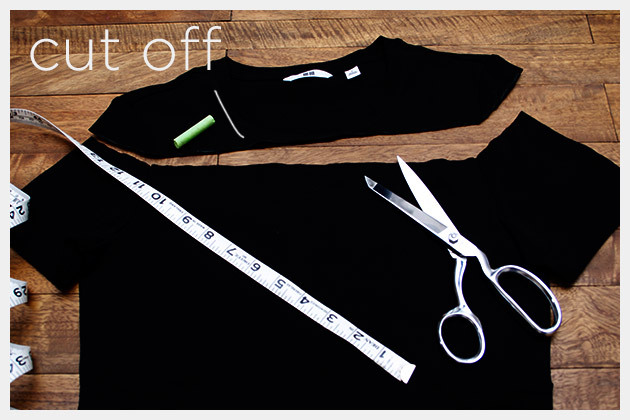 Fit them together so that they measure the same sleeve length (or close to) as the original black t shirt. When you get your spacing right, fold over about a Â¼ inch hem on the black shirt and pin your black sleeves and back to your white shirt. This may take awhile, but its very important to make sure your shirts are smooth and even. When your sleeves and back are pinned, flip your shirt over and smooth out the front. 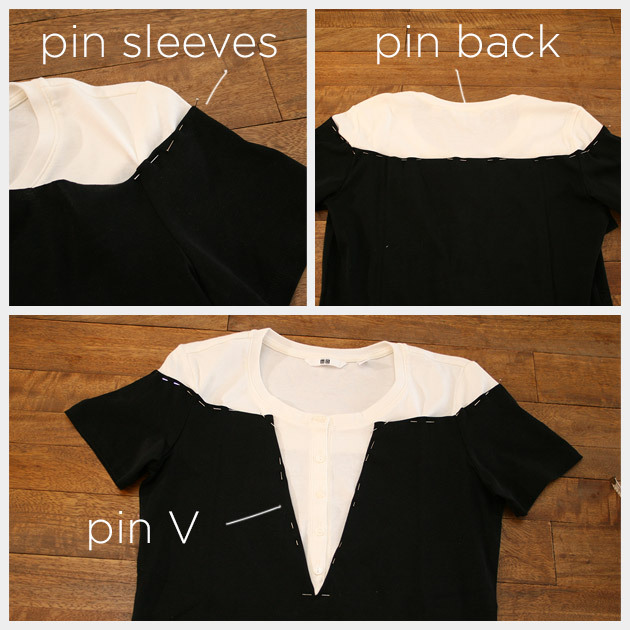 Youre going to pin the front and make the deep V.
Start by folding the black shirt over across the top to make a Â¼ to Â½ inch hem, then fold the center cut in towards the sleeves at an angle to make the sides of your V.
Make sure the sides of your V are equally spaced. Mine measures 2 inches at the top, out from the button placket, its up to you how wide or narrow you want to make your V.
When you have your V the way you want pin it down and be sure to pin the top front as well. 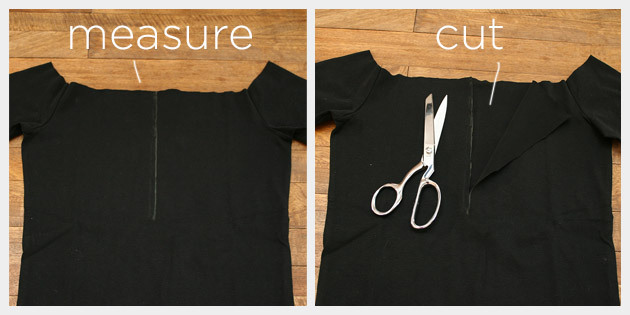 Using your sewing machine carefully sew your 2 shirts together as close as your can along the edge of your hemmed black t shirt. Sew all the way around being very careful on the bottom point of your V.
Now you will cut off the old buttons and sew on your pearl beads. Using your scissors carefully cut off the old buttons and pull out all the remaining threads from them. Using your needle and thread, sew on your pearl beads. I used the same needle holes from the original buttons, this makes it easy to know where to sew and keeps it neat. 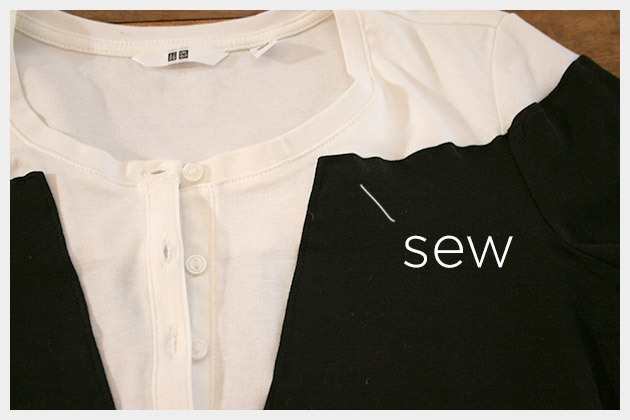 Turn your shirt inside out and trim any excess fabric leaving about one inch selvedge around your sewing. Turn your shirt right side out and youre done! 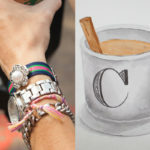 I was definitely inspired to make this DIY by the Chanel Couture Spring 2013 runway. You can see the designs that inspired me here on this previous inspiration post. Mod color blocking and bold black and white are everywhere for Spring. 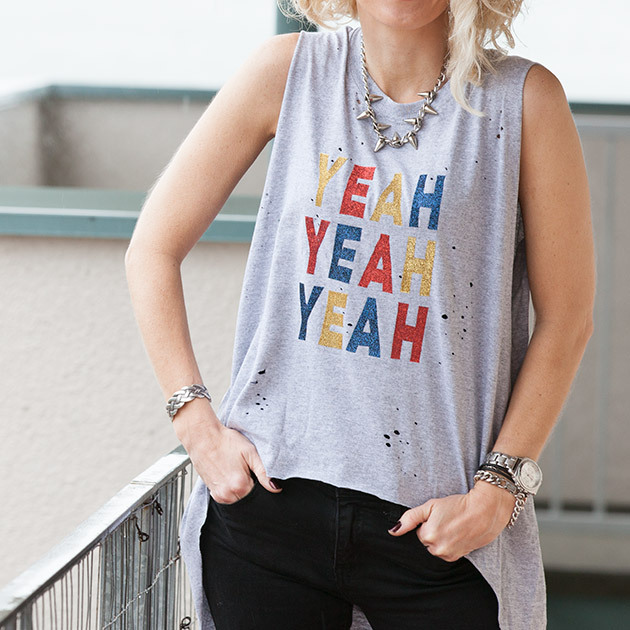 Even though its still chilly most places you can start incorporating this into your wardrobe with simple pieces like this t shirt. 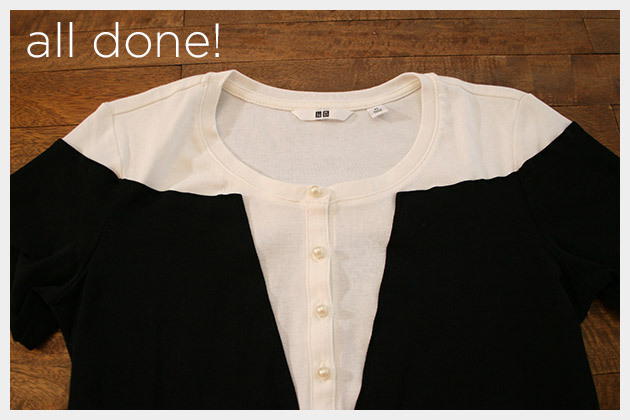 Be sure to check back on Friday for part 2 of this DIY to see what you can make with your left over sleeves. And don’t forget to check out the video! Check out my YouTube channel and subscribe, lot’s more DIY videos to come! Nice video, makes it very clear, I’m going to try it. How do you add the words into the video clips itself. I have iMovie. Excellent! Replacing the white shirt on beige, get more sexual thing. Will be more great creative. That’s a great idea, you can really mix up the colors for this shirt any way you like.